Although Maureen was prescribed donuts the weekend before her passing, this precious breakfast item was certainly not a new idea to us! Even in the land of breakfast tacos, tortillas and salsa, the donut has a strong and vibrant life. However, there was a moment for Maureen’s father, Henry Diercxsens, that the donut was indeed a new discovery, perhaps as important a discovery as America itself. For those who were at Maureen’s celebration of life, you had the privilege of meeting Henry, to hear his accent, and to meet some of his Belgian family, Francis Alÿs and Martine Diercxsens. To know Maureen is to know her family. In many ways, they are the powder that are sprinkled on the powdered donut. 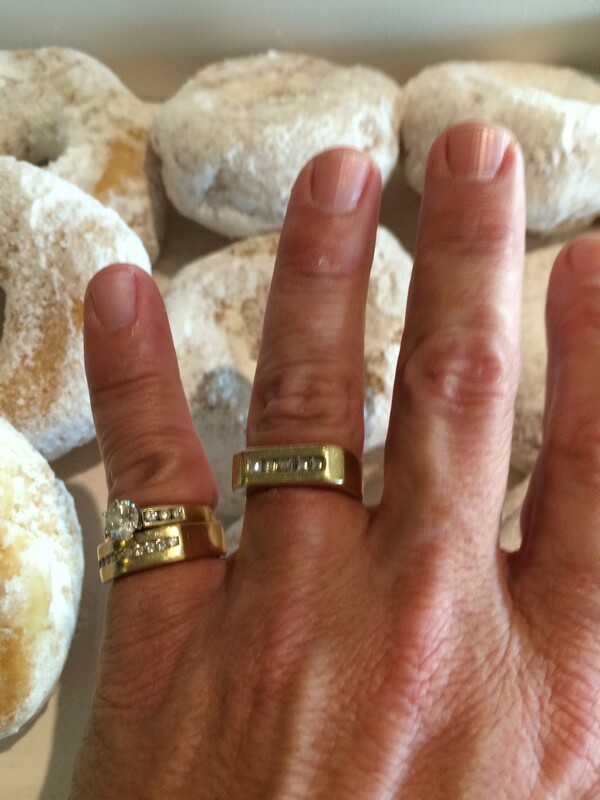 You simply can not end up as wonderful and special as the girl I met 26 years ago without having love and laughter sprinkled on you early and often…which brings me back to the discovery of the donut. As I understand the story, the Diercxsens family was on a trip from their home in New Jersey, outside of New York City, across the midwest to see their daughter, Suzanne, who was at the University of Wisconsin in Madison. Apparently, they stopped in South Bend, Indiana. South Bend was the site of the discovery, the founding of the donut. Before I get too far into this donut discovery, I have to paint some context of why it might have been so new and have taken a couple of decades to find. In the Diercxsens family and now ours, the crepe has an exalted position. The first time I met Maureen’s mom and dad, Henry, Bon Papa, taught me the recipe and how to stretch them out properly in a skillet, so they were thin and tasty. We were in Maureen’s apartment in Chicago, three floors up in a brownstone, and I can see that kitchen in the back of her apartment, standing with Bon Papa, learning this craft. I will admit, unfortunately, I still can not seem to get these darned things right! This is likely the reason the kids love going to the beach each summer with their family, their cousins, their aunts and uncles, their Bonne Maman and Bon Papa. It is there that Bon Papa makes six hundred and sixty-six crepes for over all twenty of us to have enough of this great creation, this gift of the crepe. OK, so now I can return to the donut. It is in South Bend that the epiphany of the donut was revealed to Bon Papa. I’m sure the Diercxsens girls had probably found them already. This discovery became a bit of a running joke, because I can remember visiting with Maureen at her home in Ridgewood on Fairmount Avenue for Thanksgiving and Christmas. Bon Papa would always bring back a dozen of these gems from Dunkin Donuts at some point in the holiday, slathered in glaze, sprinkles or some other fascinating combination. His wonderful family would tease him about his discovery in South Bend. A great man, like Henry, would always laugh along. You can usually tell that the whole Diercxsens clan is together, because that is always when the laughing starts. And, that laughing was not only reserved for the easy and light times. Even when things were tough, laughter was never far away. It was always just below the surface. When Maureen leaned forward in our Honda Odyssey the weekend before her passing and blew the powder of the donut everywhere, we still laughed. Even with her compromised breathing, oxygen nozzles lightly blowing richer air by her nose, as the love and the powder blew, we still laughed. I will never, ever forget laughing with her. I know none of us will. Even as I cry writing this, I still can’t help but chuckle. I was married to a loving and crazy girl. As I prepare to tell the last of the stories in this donut blog post, it just dawned on me that this story occurred the Sunday after Maureen’s services, exactly a month ago today. I now realize why I was not meant to tell this story any sooner than now, because it is sacred, and it is holy. It reflects the twelve, not just a dozen donuts, but the twelve that were assembled around our Lord, the same Lord that welcomed Maureen back into His arms, back to heaven. When I went to the same donut shop of the now famous powdered donut, I wanted to buy a dozen. I couldn’t. They only had one. Yes, one. I thought to myself well that is a bummer. It wasn’t until later the morning back at the house in Lakeway where the family, friends and others had been staying, that I realized that the fact there was one was but another message from Maureen and her family of angels in heaven. For I took that one powdered donut and went from person to person in our circle on the deck, with the hill country behind us, and blew a bit of powder on each person and then tore a small piece of the donut off to share with each of us assembled. As I continued in this act, I suddenly realized that we are in the midst of the most sacred act of communion, a communion of love being blown over all of us from above. As we eat donuts on the 21st of each month, we are all now in a communion circle together. For the donut itself is a circle, and it connects us no matter where we are, just like Maureen.